DIY Mold-Resistant Breadbox | OhGizmo! What originally started as a simple challenge to improve an everyday, mundane item led to this home-made breadbox that actually prevents mold from growing on the surface of any breads stored inside. Starting with an existing stainless steel breadbox the creators mounted an ultra-violet light salvaged from a water purifier system inside the lid which is of course the key component to keeping the mold growth to a minimum. 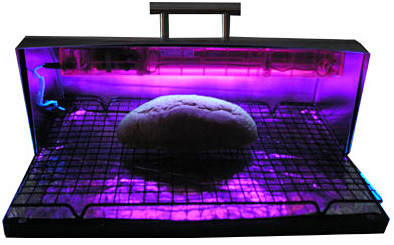 The other important addition was a light controller that automatically turns the bulb on and off at random intervals as too much heat from the bulb could assist in mold growth and UV light can actually have an impact on the nutritional value of the bread. Through various tests the creators found that the box would completely prevent mold growth on bread for weeks at a time compared to breads left in a standard ‘boring’ breadbox. hi friend i think it is good and so i agree with you! I think it is good. Nice idea… Thanks for sharing it. It's a nice breadbox. I love to see it again.